“All of nature begins to whisper its secrets to us through its sounds. Isn’t that a beautiful quote? We are surrounded by such beauty in nature and our own back yards can be a wonderful source of decor items. In my home I wanted to whisper fall softly and subtly. 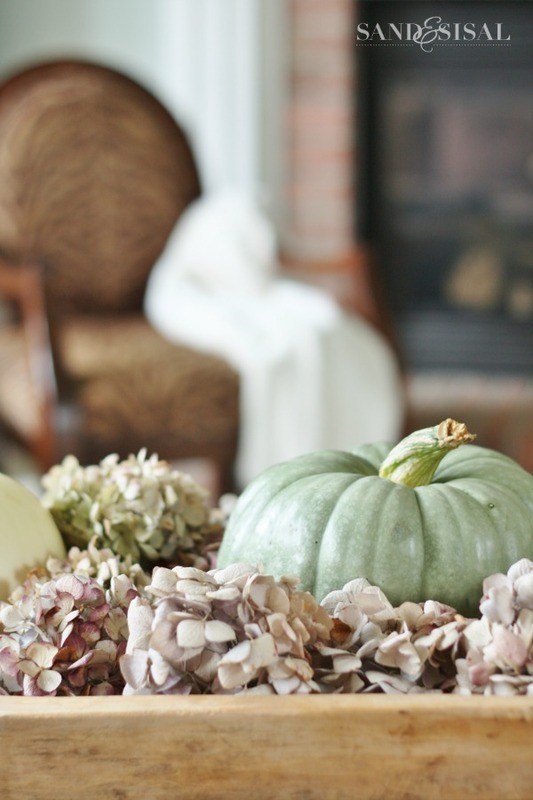 I shared my White Pumpkin Centerpiece with you all last week, and extended the same theme into the family room, decorating with natural items and a neutral fall color palette. 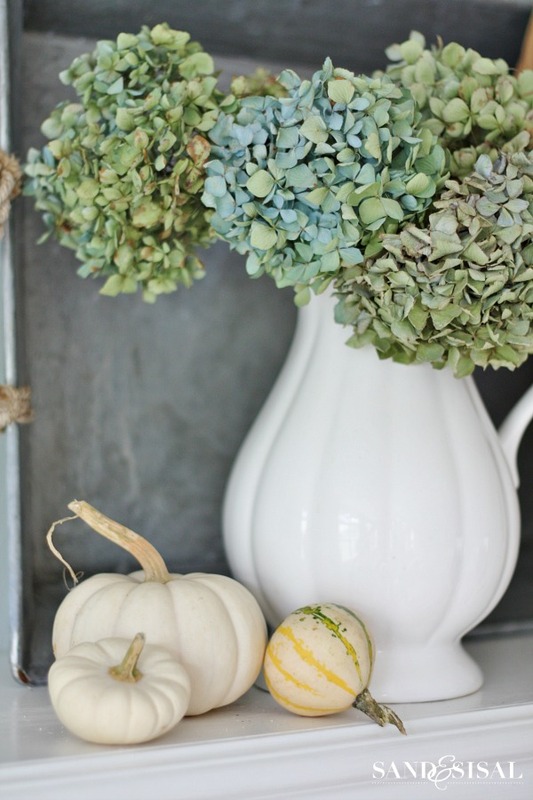 Pears, white and green pumpkins are scattered throughout the room. 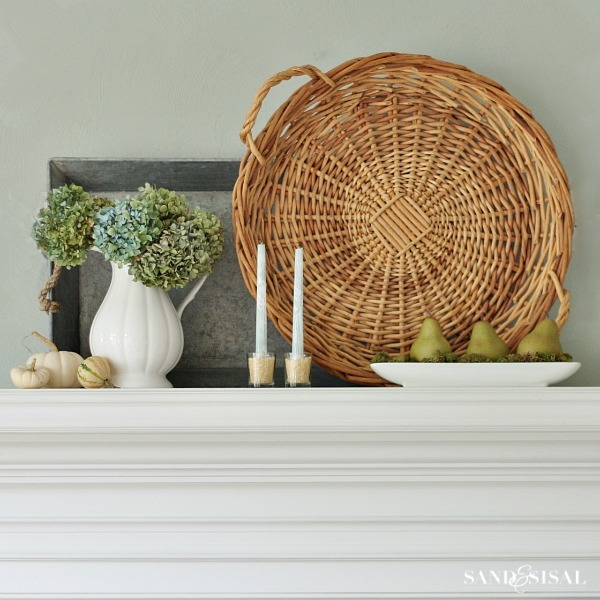 The mantel was kept simple with dried hydrangeas from the yard, a galvanized tray and wicker basket. 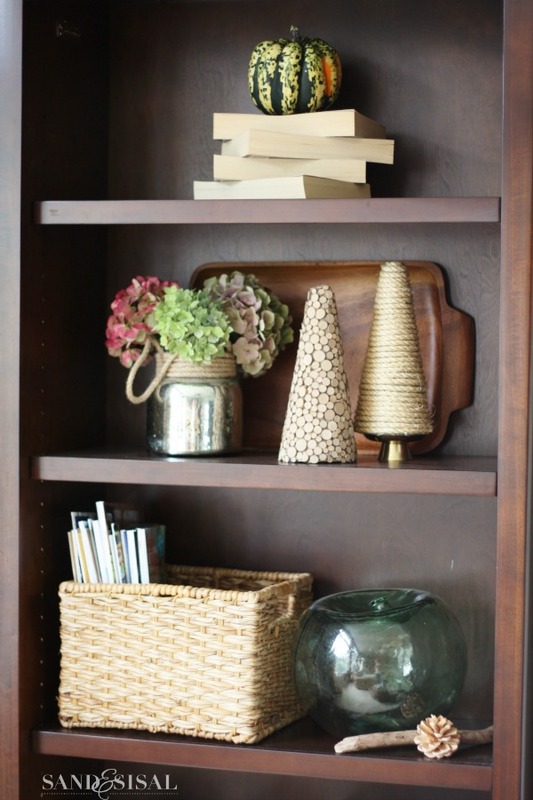 Crepe myrtle tree branches were placed in a large glass vase filled with wine corks. They have such beautiful seed pods. 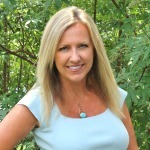 When I decorate with natural elements and a neutral color palette, then mixing and adding multiple textures is important. 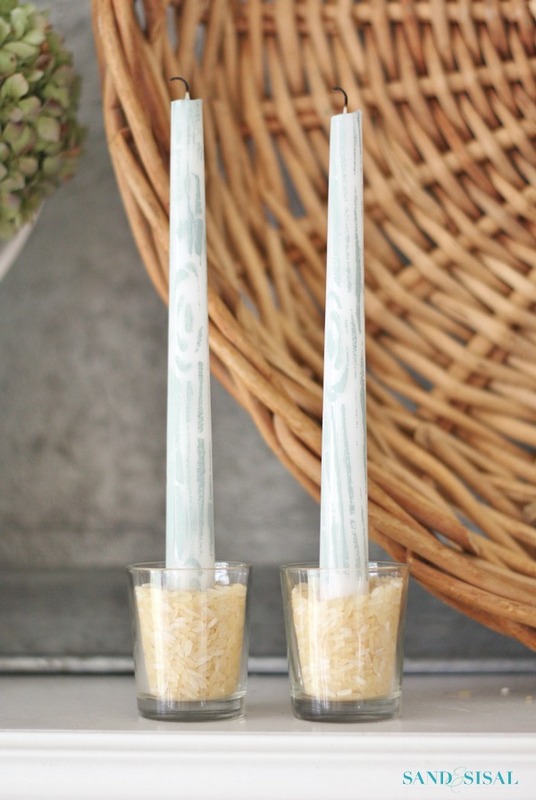 Votives filled with rice hold taper candles nicely and firmly. I painted a faux bois pattern on each taper with chalk paint. I’ll demonstrate how to do that later this week. Most people think that because I’m a coastal decor chick then all my wood work and furniture in our home would be white. Well, my hubs is very traditional and he loves dark wood. So as in every marriage, we have to compromise, and therefore have quite a bit of dark wood furniture. 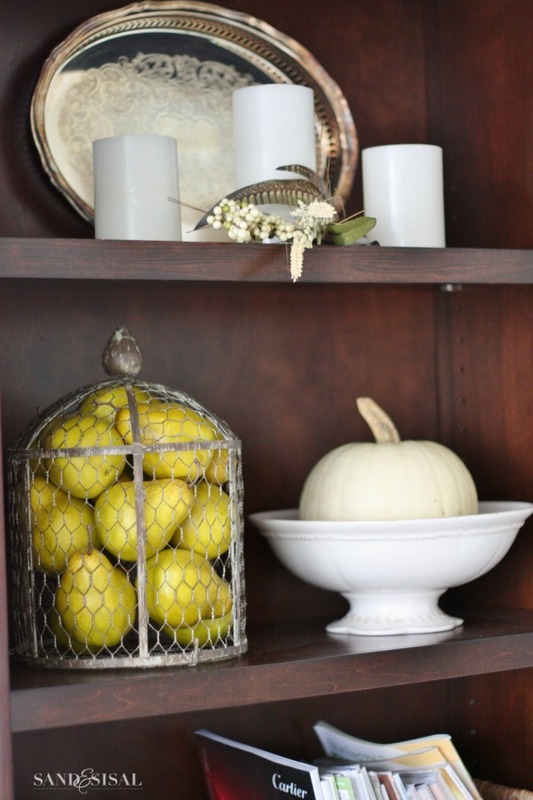 I’ve tried to lighten up our bookcases for fall with white candles, baskets, white pumpkins and pottery. My huge dough bowl is filled with pumpkins and goose neck gourds, and of course, more dried hydrangeas. I have more dried hydrangeas then I need but I can’t resist their fluffy, full blooms! (Click here to learn how to dry hydrangeas). Do you hear it? Shhh…. there is is. The quiet, understated whispering…. fall is here. Ha! Thank you Becca! My hubs used to be one of those “you can’t paint wood” kinda guys. I’ve reformed him though. 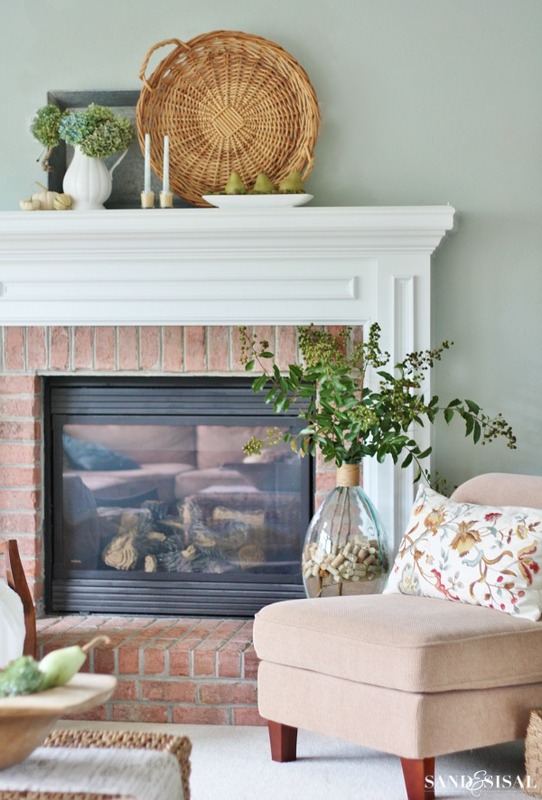 I’m still working on convincing him that the fireplace brick should be white washed…. I might just go for it and deal with the wrath that will most likely follow. 😉 OR maybe I should turn it into a sponsored post…. money always talks to men. Ha! 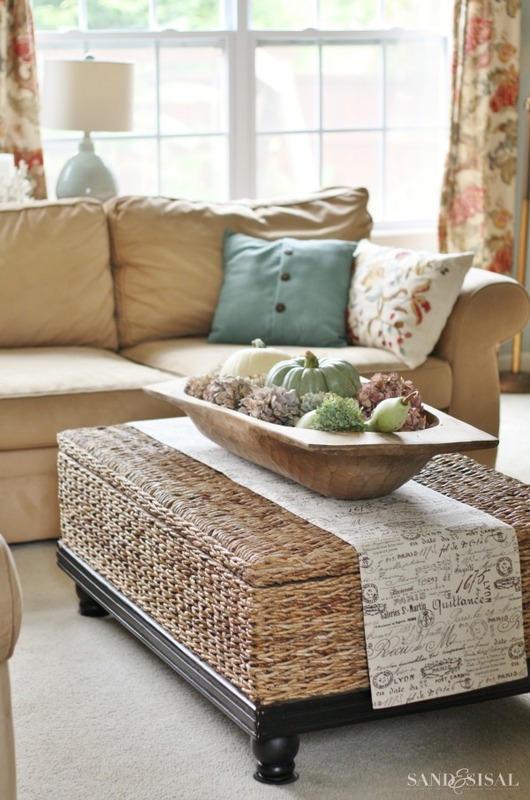 Kim your family room is gorgeous and I love that quote so much! 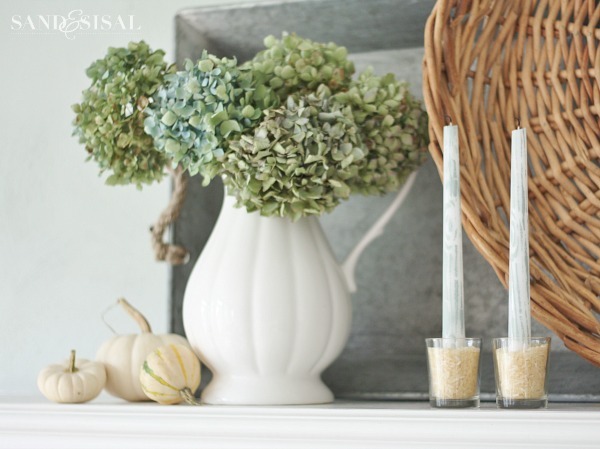 I love the soft colour you used for your fall décor.